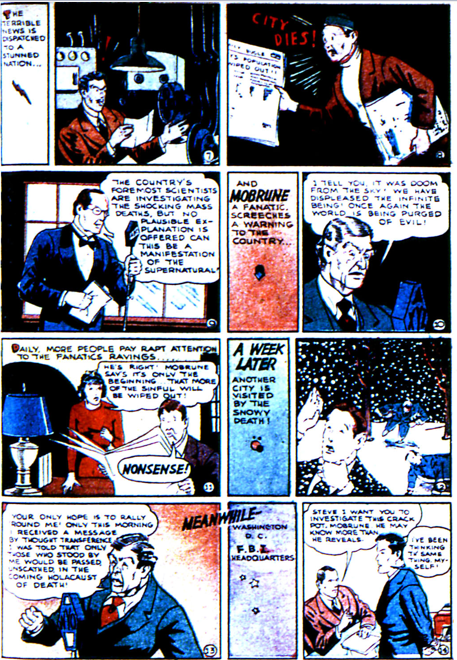 Adventure Comics 70 (Jan 42) saw the final appearance of Steve Carson, and the Federal Men series. As the war loomed, more and more of the stories took on a military connexion, with Steve going after spies and saboteurs more frequently. In his final story he took out foreign spies causing deaths in a munitions factory. 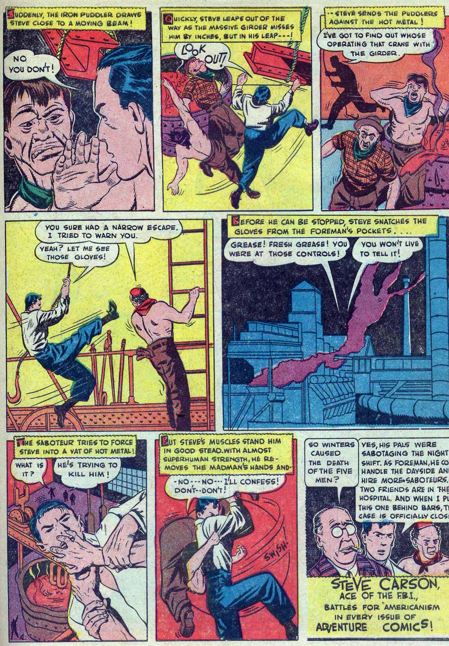 The series never again reached the heights it had under Shuster, though part of the problem was that it never exceeded four pages per issue. As with the final story, too often the stories have unsatisfactory explanations jammed into the final panel, they simply try to do too much to keep the series entertaining, and you can’t help but feel that another two pages per story would have helped. 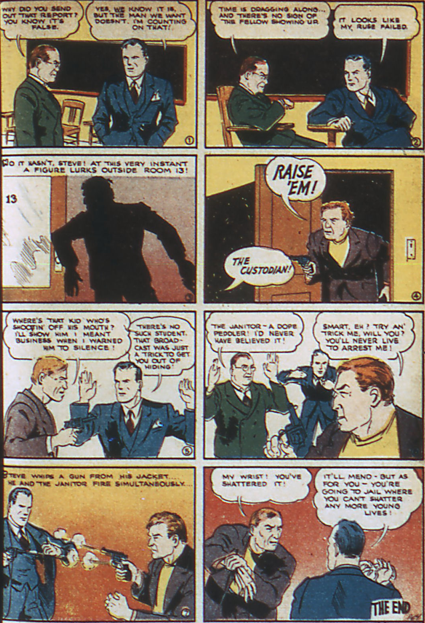 After some preliminary action fighting an escaped lion, Hourman’s story in Adventure 53 (Aug 40) settles down to being about overworked child factory staff. Jimmy Martin is introduced, the brother of an employee who died. But as the cover suggests, there is more to this story than the evils of making children work at factories. 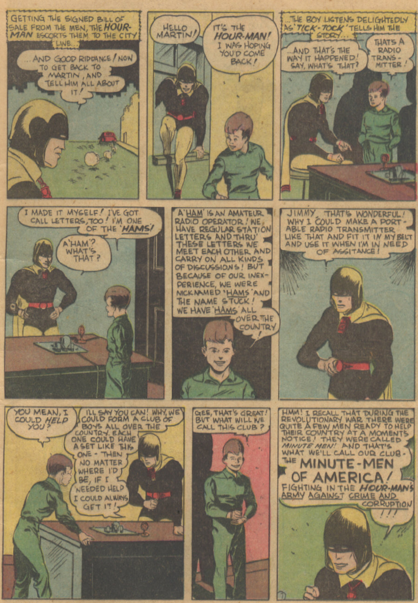 Jimmy Martin is a HAM radio operator, and Hourman instantly sees the potential uses of this for crime fighting and/or drug dealing, so immediately recruits Jimmy for the Minute-Men of America. At the moment Jimmy Martin is the only member of this team, but others would soon appear, a small army of children lead by a drugged up hero. A new series begins this issue, Mark Lansing of Mikishawm. Mark is a soldier of fortune, travelling through the African jungle with his native guide Koba, when he stumbles upon Kit and Tony, two Americans on safari who in turn have stumbled upon Vas Onga, an evil blue skinned alien from the inner Earth land of Mikishawm who has invented a machine that uses “internal vibrations”, with which he plans to conquer the world! Holy cow! Well, Mark defeats Vas Onga pretty fast, but the machine does bury them, and the opening chapter ends with the group following Jada, a friendly blue skinned alien down into Mikishawm. This serial would run only 10 chapters, though on the whole it’s not bad. Federal Men gets an above par story in this issue. 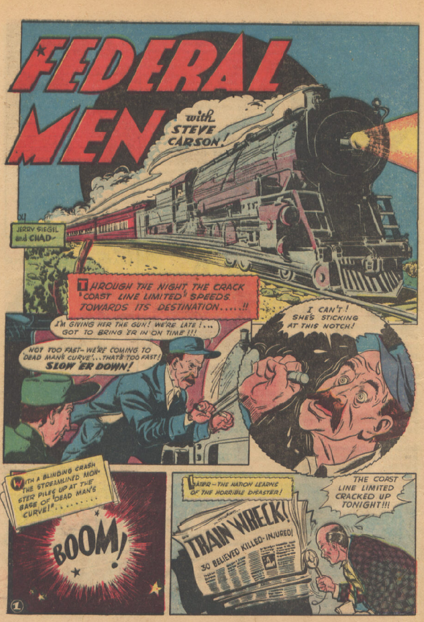 Usually the art is mediocre-awful, but the splash page of this story about derailing a train to steal the radium being transported is a pretty good 4-pager. 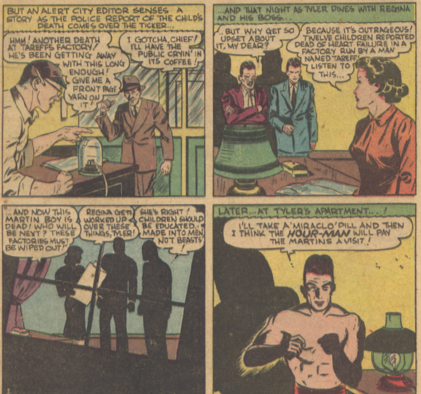 The Sandman story in issue 41 (August 1939) has little of the mood of the first story, largely because for much of it Wesley is in swimming gear, though keeping on the gas mask. I doubt it aids him in the water, and while it sure does make him look creepy, its not in a good way. I’m surprised the woman trusted him to help her against the murderous smugglers. 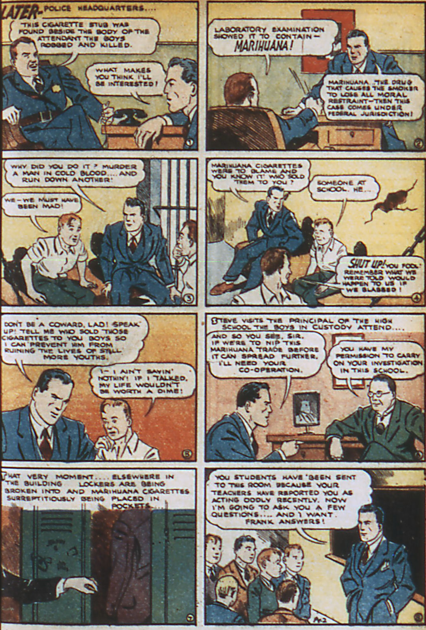 The Federal Men story in 41 is the last drawn by Joe Shuster, although his name is not on it, and it’s not up to par. But his vision was failing rapidly and some of the figures look much like his, so I believe the official accreditation. The story is particularly dramatic, people are killed by poisonous snowfalls, the toxin placed into the clouds by a fire-and-brimstone public speaker to draw larger crowds and make more money. Heck of a plan. Once Shuster leaves the stories lose what little spark they still had. Makes you wonder how much of an influence he had on the writing. Without him, Siegel’s tales stay firmly rooted in standard crime stories, no giant robots or future child cops. Adventure 39 – Federal Men – Marihuana! To be fair, these are children, and the dealer is revealed to be the school janitor, which is creepy. 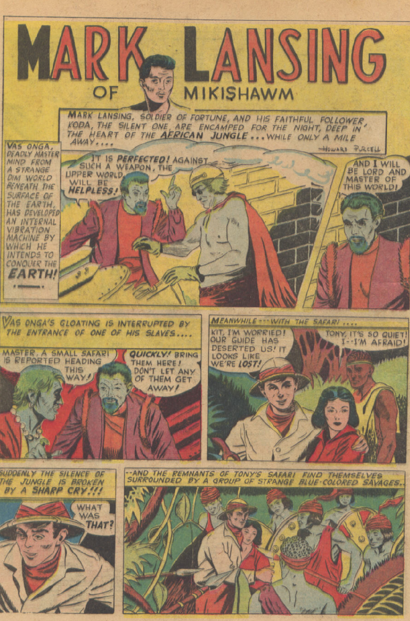 Once the comics code was created, even the mention of “marihauna” was banned, but there are sporadic mentions in DC comics of the 1930s and 40s. 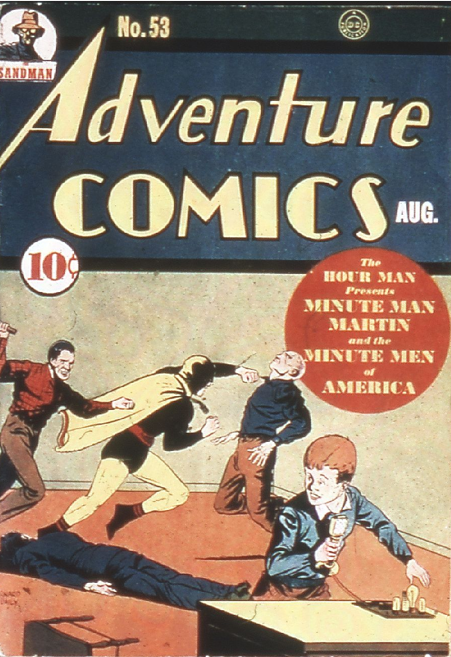 With issue 32 (November, 1938), Adventure Comics finally adopts the title it would become famous under. 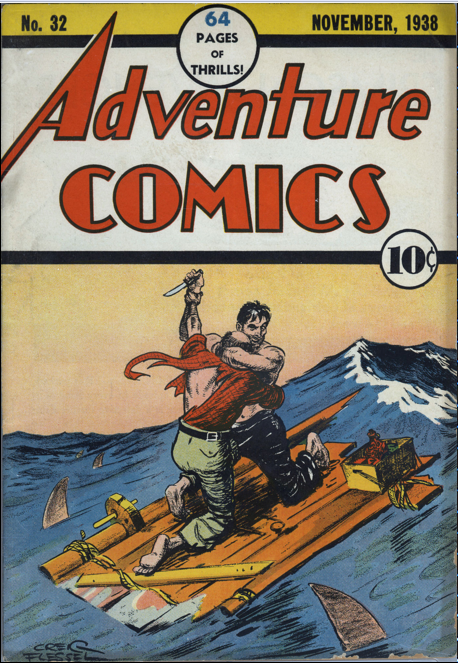 The covers remained generic, and once again there was no change of content to match the change of title. It also saw the beginning of a 5 part storyline in the Federal Men series. Steve gets trapped in a burning house while trying to rescue a fugitive, and though he survives the house’s collapse, he loses his memory. Discovering a gun in his pocket, he believes himself to be a criminal. He winds up joining the Biff Davis mob, but after stopping Biff from shooting a cop (which results in Davis being shot and killed), he argues to the gang that he did it for their benefit, to prevent them from being pursued as cop killers. He becomes the new boss of the gang, and leads them on a series of bank robberies in which they use knockout gas to incapacitate the tellers and guards, gaining his crew the nickname the Phantom Gang. Ralph Ventnor is assigned to the case, as Steve informs the gang of his plans to pull of a $40 million gold robbery. 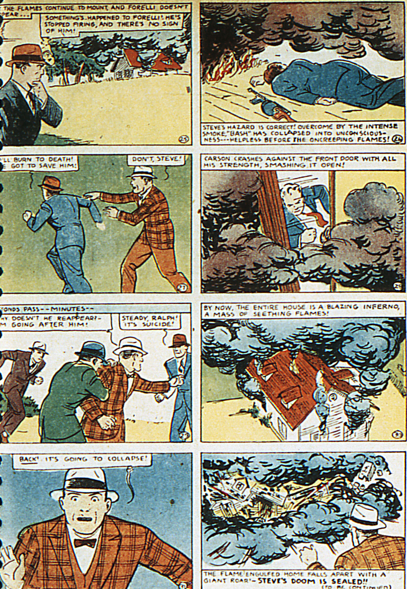 One of the gang members, Red, gets caught trying to rob a jeweler, and tells Ralph he is part of the Phantom Gang. He is released to be an informant, but instead tries to set Steve up, plotting to kill Ralph and frame Steve for it, taking over the gang in time to pull off the gold robbery. 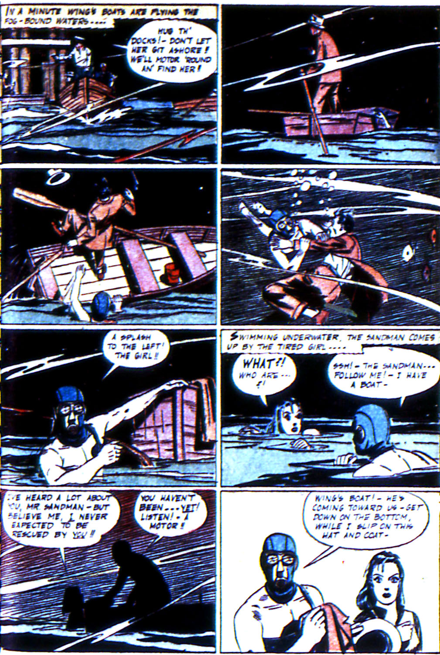 Ralph recognizes Steve, and Steve’s memory returns in time to thwart Red’s plan, and the gang gets apprehended. Great story. This story, the conclusion of a two-parter, is significant solely for the villain, the Cobra. The plot itself is a standard kidnapping story that Steve Carson solves fairly easily, though he does wrestle a giant cobra. It’s not the villain’s scheme or giant snake that earns him a mention, though, its his appearance. 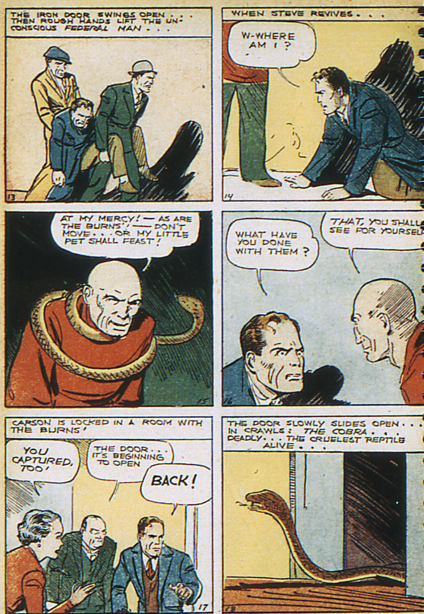 The older, bald man, often hunched, or looming, was a look that Siegel and Shuster would bring back for the the Ultra-Humanite, and later for Luthor. It’s not really so surprising that that occurred. Clark Kent, Dr. Occult, Slam Bradley and Bart Regan, the lead character in Spy, all look pretty much exactly the same as Steve Carson. 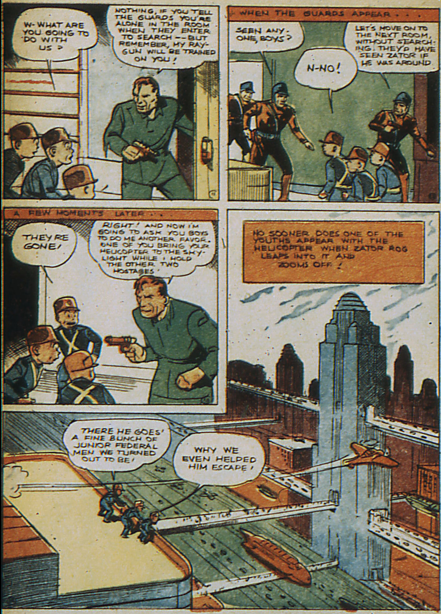 The last of the stories featuring the Junior Federal Men, New Adventure Comics 25 (May 1938) brings back the notion of the Federal Men of the future, combining it with the children’s version of the team. A group of boys in the year 3000 come across old issues of New Adventure Comics, read the tales of Carson and the kids, and are inspired to emulate them, capturing Zator Rog. Sadly, there is no return appearance by Jor-L.